Where Are Rear-Entry Boots Now that We Need Them? Actually, so did the 65+ age group, although to a considerably lesser degree, which suggests that some concatenation of factors causes senior participation to fall off after what we were raised to believe was “retirement age.” Why would senior skiers, by and large an affluent lot, with more leisure time available than at any earlier period in their lives, choose to ski less just when they could be skiing more? I don’t have any statistics to support my suppositions, but I suspect that at least three factors contribute to the drop-off in senior participation. One is fear of injury, not due to a decline in skills but to concern over collision with another skier or rider. There isn’t a silver skier on the hill who hasn’t either already been clipped or knows someone who has been put out of commission in this way. And three, as aging gradually erodes flexibility, the challenge of slipping into an alpine boot finally becomes too painful an ordeal. While 3-piece shells are marginally easier to manipulate, the classic 4-buckle overlap shell can only be entered if the boot has been heated to roasting temperature. While the solutions to problems one and two aren’t so easily solved, the solution to the third issue is self-evident but for one tiny problem: you’ll need a time machine to fix it. That’s because the last good rear-entry boot, which go on as easily as moccasins, breathed its last breath 20 years ago. 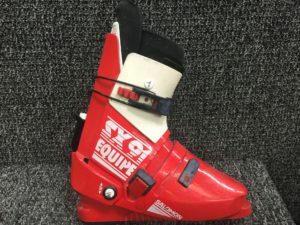 That’s when Salomon, the only brand that continued to champion the concept into the 1990’s, decided to destroy the molds for the best rear-entry boots ever made. This is the story of what killed a concept that provided comfort and unrivaled convenience for millions of skiers. Boiled down to its essence, what drove the rear-entry boot out of existence was disdain for its perceived performance limitations. (This despite a young Marc Girardelli winning World Cup races on the SX90 Equipe, the predecessor to the iconic SX91.) Salomon’s success with the concept, particularly with the SX91, forced its rivals to compete. Unfortunately for the competition, and ultimately Salomon as well, is that all the pretenders were inferior when they weren’t hysterically awful. Lange’s attempt at a rear-entry seemed to be created solely to prove what a bad idea the whole concept was. The SX91, the iconic rear-entry that turned the boot market upside down in the mid-1980’s. This left Salomon with wildly popular boots and some 20 other brands with little recourse but to insist on the merits of the concepts rear-entry had replaced. The incessant drumbeat created by this chorus of competitors was that rear-entries were for losers. Shop personnel went from recommending them to disparaging them. Coaches insisted their charges not try to race in them. Within a decade, the rear-entry concept went from owning the market to being shunted off into rental inventories. Today, no one even makes a rear-entry rental boot, which is insane as it is supremely adapted to this purpose. I spoke at length with Dave Bertoni about the demise of rear-entry, as he was working in the boot division at Salomon the day the company decided that it would destroy the molds that had made it so profitable it could buy Tailor Made and have enough change left over to build a ski factory. If the decision to jettison what was conceivably still an important asset sounds loopy, it’s because French law taxes businesses on their assets as well as income. By 1997/98, the molds had been dormant for years and no longer represented a viable commercial opportunity. So off to the foundry they went. Bertoni’s theory about the demise of rear-entry reflects his worldwide responsibilities and perspective at Salomon’s boot division. “On balance, the European, under-booted, over-skied skier is happier than the over-booted, under-skied American.” Translation: European skiers by and large ski on softer, recreational boots and expert-level skis, while Americans are coaxed into stiffer, high performance boots but ski on less precise recreational skis. Thus it came to pass that Americans rejected the comfort and ease of rear-entry boots, despite the obvious advantages to most skiers, on the advice of experts who felt that rear-entries placed a limit on performance their customers were perhaps unlikely to attain in any boot. Salomon’s management, after fighting to preserve rear-entry virtually on its own, realized that its image as a ski and binding supplier was being degraded by its association with rear-entry boots. Bertoni was in the room when the decision was announced that the rear-entry molds were destined for the dumpster. Bertoni was dumbfounded, as he was certain some angel would descend from the boot heavens to save the best rear-entry boots ever made. But the call never came. Forced by market opinion to become yet another purveyor of 2-piece, 4-buckle boots, Salomon turned all its vaunted product development skills to making the best of this tired genre. The brand now dominates international boots sales, virtually lapping the field. In the U.S., sales statistics support their unparalleled success, with the six top-selling boots in America for the past two seasons. Bertoni compares the Salomon experience with rear-entry boots to the conflict between Apple and Microsoft when the former first began to compete for the affections of the business community. Non-technical users loved Apple, but the tech mavens who guarded the gate to IT departments preferred what they could with MS-DOS. The difference, of course, is that Apple survived to find its footing in the business world, while Salomon no longer had the will to fight every competitor in a market hostile to its innovations. And skiers, young and old, lost access to boots that were simple, comfortable and went on like slippers. We are all the poorer for this loss.